We’d love your help. Let us know what’s wrong with this preview of Academaze by Sydney Phlox. Academic life can be wonderful, but also daunting. This collection of essays and cartoons on life in academia provides an “insider’s guide” to the tenure track and beyond in science, technology, engineering, and math (STEM) fields at a major US research institution. 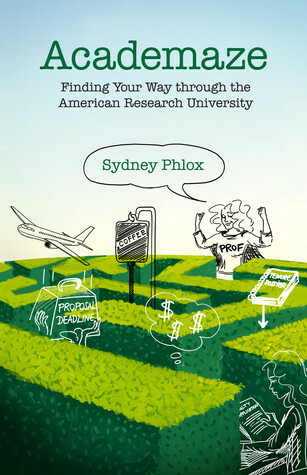 Sydney Phlox, a pseudonymous tenured professor, takes the reader through the maze of academic life: from the Academic life can be wonderful, but also daunting. This collection of essays and cartoons on life in academia provides an “insider’s guide” to the tenure track and beyond in science, technology, engineering, and math (STEM) fields at a major US research institution. To ask other readers questions about Academaze, please sign up. Academaze is just the book that I needed to read as a fifth-year tenure-track professor in the physical sciences. The pseudonymous Dr. Sydney Phlox speaks with the voice of the somewhat older and wiser but also down-to-earth and irreverent tenured woman who doesn't exist in my department (but I wish she did). She's smart and savvy and gives you the inside scoop on the intricacies of academia, while also leaving you with the unshakeable conviction that despite her occasional cynicism and attempts Academaze is just the book that I needed to read as a fifth-year tenure-track professor in the physical sciences. The pseudonymous Dr. Sydney Phlox speaks with the voice of the somewhat older and wiser but also down-to-earth and irreverent tenured woman who doesn't exist in my department (but I wish she did). She's smart and savvy and gives you the inside scoop on the intricacies of academia, while also leaving you with the unshakeable conviction that despite her occasional cynicism and attempts at curmudgeonliness she is still totally starry-eyed and in love with physics. Academaze, and the xykademiqz blog from which it sprang, have filled the gaping hole in my life left by the demise of the Female Science Professor blog. FSP got me through grad school, and now Academaze and xykademiqz are getting me through the tenure track. The book is remarkably comprehensive. It is divided into 12 chapters that cover every aspect of academia I've encountered in my career so far, plus a few that I haven't yet. Some of the more unusual subject matter coverage included advice on mid-career lateral and vertical moves within academia, as well as specific tips on writing NSF CAREER grants. I would enthusiastically recommend the book to anyone considering a career in academia, from the undergrad who asks me how I spent my winter "vacation" to my friends currently navigating the tenure track at universities around the world. The sweet spot might be postdocs on the job market and newly-minted assistant professors. While Dr. Phlox's perspective is somewhat peculiar to the American R1 university, as a professor at a research-oriented liberal arts college I found most of the insight and advice to hold for my university environment as well. While I expected insight on the research front from a successful tenured professor at an R1, I also found her insight into the different components of successful teaching particularly thoughtful, as she framed the requisite skill sets differently than I'd thought of them before. Her musings "On Classroom Teaching" have helped me reframe my personal definition of success in the classroom. Her love of teaching undergraduates is particularly refreshing coming from an R1 professor. My main source of discomfort in reading the book was that there are several places in which Dr. Phlox's obvious love for her work veers a little too close to perpetuating the myth of the academic who eats, breathes, and sleeps science. Despite a refreshing and practical guide to dealing with impostor syndrome early in the book, there were several parts of her book that activated my own impostor impulses, including a several-page-long list of things she got done at home on a sick day with her child (a list that was closer to a typical week's worth of research work for me! ), as well as her rapturous description of how wonderful it feels to get home early and use her surprise 20 minutes of free time alone in her house to edit her students' conference abstracts. I'm still very much in the trenches parenting-wise with an 11-month-old at home, so maybe sick days will look different when I can plop a school-age child on the couch with a puke bucket and unlimited Netflix… but at least at this stage when I'm home with my sick kid I spend every minute dealing with clinging, whining, bodily fluids, laundry, and nonstop nursing -- I'm lucky if I can use naptimes to keep on top of email and change into a non-snot-covered shirt. To be fair, later in the book Dr. Phlox does a great job of covering work-life balance, and I felt vindicated when I read her observation that the most productive grad students seem to be the ones who keep a very regular schedule and actually get work done during working hours (that was totally me!) instead "working" around the clock. I'd just hope that the extreme productivity sections of the book don't scare off young women like me who don't feel like they can ever be the creature who makes use of every free 5-minute chunk of time to get more work done. Great read by a talented author, professor, scientist, mother, and illustrator. I'm not a professor. I'll never seek tenure. I've never written a scientific research paper. I won't be applying for grants any time soon. I haven't taken a STEM class, or any college class for that matter, since the 1990s. So why did I read this book? Two main reasons: (1) I'm a fan of the author's fiction writing under a different pen name, and I figured the text would display the same solid writing I already knew; a Great read by a talented author, professor, scientist, mother, and illustrator. So why did I read this book? Two main reasons: (1) I'm a fan of the author's fiction writing under a different pen name, and I figured the text would display the same solid writing I already knew; and (2) from a brief scan of the table of contents, it appeared many topics applied to my life, even though I was not trying to find my way through the maze of the American research university. I was pleased that this book met both expectations. First, the crisp, clear writing is a breeze to read. The chapters are short, and the author does not use technical words, math, or physics that could bog down lay readers like me. The writing is serious when it should be, and humorous and sarcastic when levity is needed. I was happy to learn that the writing was on par or exceeded what I was already familiar with in the fiction context. Second, the book broaches subjects far and wide that I could identify with, and I feel many others outside the author’s field could as well. For example, I attended a public R1 university for undergrad similar to Dr. Phlox’s university, so I could relate to the student side of her discussions. I now have a greater understanding of what my professors endured. Although teaching is an essential part of being a prof (indeed, that's what we thought our tuition was going toward), that’s just one aspect of the job. Dr. Phlox explains the pressures to research, obtain grants, publish, give speeches, mentor, and oversee projects that are akin to running a business or company. After reading the book, I wished I could take a time machine back to undergrad so that I could thank again the professors who took an interest in me, edited my papers, spoke with me during office hours, graded my exams, and shaped me as a student and human being. I’m also a professional, and I have a doctoral degree in another discipline (law). In this regard, the book hit home on many levels. Dr. Phlox's chapters on obtaining an advanced degree, time constraints, politics in the workplace, work-life balance, race and gender discrimination, stereotypes, balancing career with home life/childcare, are as applicable to STEM profs as they are me or to anyone else who works in a demanding field for a living. Finally, I write for my law job, and, like the author, I write fiction in my "spare" time. I devoured Dr. Phlox's chapters about her writing experiences. She summarizes one of my favorite books, Stephen King's On Writing, and her discussions on editing, revision, and peer review apply with equal force to most forms of writing, whether a scientific paper, grant proposal, law review article, appellate court brief, or flash fiction. Ok, not as good as the blog. More background, less ranting. As a longtime reader/fan of Xykademiqz, I was thrilled to get my hands on a copy of Academaze. To boil it down, this book is about 1) things professors do, 2) the steps you take to become a tenured professor, and 3) what it's like doing the job, both the good and the bad (and how to deal). I thought it was a very interesting and useful read. It offers lots of practical advice on topics including job hunting, getting tenure, mentoring and working with trainees. It also provided me with a wider pe As a longtime reader/fan of Xykademiqz, I was thrilled to get my hands on a copy of Academaze. To boil it down, this book is about 1) things professors do, 2) the steps you take to become a tenured professor, and 3) what it's like doing the job, both the good and the bad (and how to deal). I thought it was a very interesting and useful read. It offers lots of practical advice on topics including job hunting, getting tenure, mentoring and working with trainees. It also provided me with a wider perspective of academia; I personally only have had experience with academic life (beyond undergrad) in one department at one university. This book is also well organized, with many subsections within each chapter, making it easy to pick out topics of interest. -I would have liked to see more on dealing with imposter syndrome. I would have found it personally very helpful but I think since this is such a prevalent and persistent problem, it would have been valuable to hear more about how Prof. Phlox deals with this since it seems she has been quite successful! I spent several enjoyable hours over the past week reading an advance copy of Academaze. Written by Sydney Phlox, the author of the academic science blog Xykademiqz, this book is a thoughtfully organized collection of previous posts that showcase her decent, humorous, and realistic approach to academic life. Dr. Phlox is a physical scientist at an R1 institution, but I would imagine most material would be useful to a range of physical and biological professors at many types of institutions. Fund I spent several enjoyable hours over the past week reading an advance copy of Academaze. Written by Sydney Phlox, the author of the academic science blog Xykademiqz, this book is a thoughtfully organized collection of previous posts that showcase her decent, humorous, and realistic approach to academic life. Dr. Phlox is a physical scientist at an R1 institution, but I would imagine most material would be useful to a range of physical and biological professors at many types of institutions. Funding advice is, however, primarily focused on NSF. Dr. Phlox’s tone is confident and sassy, introspective and empathetic. While articulate about the challenges of the job, her genuine fondness for her students and her mentees comes through, as does her passion for research and writing. Phlox is both honest and kind, without idealizing PIs or their mentees. She also has a wicked sense of humor! Reading Academaze was like having a long chat with a colleague who’d had experiences similar to mine, but actually processed them instead of simply surviving. It was invigorating and inspiring, and I’m looking forward to sharing the book with my students. I recommend it both to those contemplating entry into, and those already in the midst of, the academic maze. This book should be required reading for anyone considering becoming a professor. Many of the details are specific to a big university vs. teaching at a smaller, teaching-oriented college, and physics vs. a different STEM field, but it still gives a great overview of what to expect. I recognized many of the situations from getting my Masters, and I wish I would have read this before I chose my major professor. It may have saved me from trying to get a Ph.D. with someone who didn't support me. As This book should be required reading for anyone considering becoming a professor. Many of the details are specific to a big university vs. teaching at a smaller, teaching-oriented college, and physics vs. a different STEM field, but it still gives a great overview of what to expect. I recognized many of the situations from getting my Masters, and I wish I would have read this before I chose my major professor. It may have saved me from trying to get a Ph.D. with someone who didn't support me. As a women in science, I also appreciated her candid discussion of sexism in science. She talked about her coping mechanisms and when to let it roll off your back and when to call out the speaker. An excellent book for anyone considering a career in academia. In fact, every lab should have a copy. I expect it would make these strange professor beasts way more understandable to people who work for them.